This soup had me gleefully dancing around the kitchen, hence the “mambo” in the title. I’ve only had cherries twice this summer which is not nearly enough for a cherry-lover like me. I was overjoyed that frozen organic cherries were added to the freezer section at my grocery store, so I grabbed several bags. Since I love pineapple and cherries together, I was just going to blend the two together and pour into a glass. But, then I saw the ripe mango on my counter. Mango and cherries are another match made in heaven, so I couldn’t resist adding it to the mix. The diced celery provides some texture and crunch. When I get on the roll with smoothies and juices, it is nice to have something to chew every once in a while. This deep-red velvety soup was created on the perfect warm fall afternoon. This is a quick recipe with a fancy twist. I ate it for lunch in my sunshiny yard in full appreciation for the waning warmth of the summer sun. Tucker entertained himself nearby, watching the birds in the bushes and digging his nose in the dirt like a piglet. 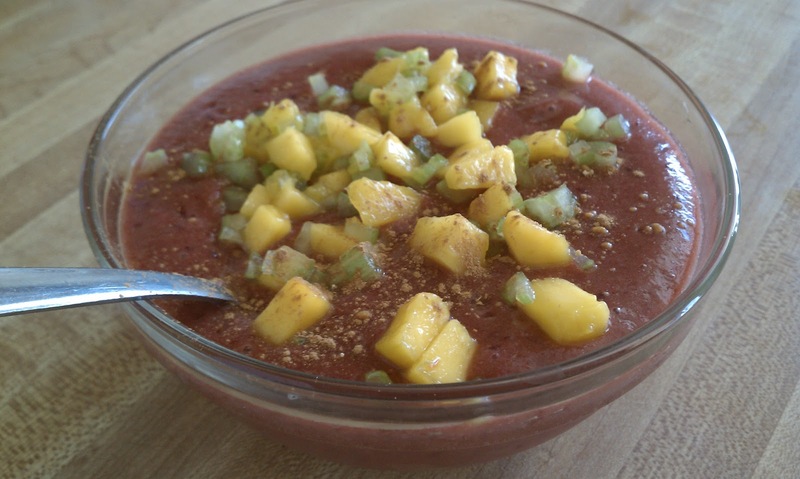 -Blend pineapple, cherries, frozen mango, lettuce, and vanilla until smooth. -Place in a bowl and top with diced celery and fresh mango. -Garnish with a few sprinkles of cinnamon and ginger.